Add some extra flavour to prawns (shrimp) with a little lime and chilli and pair with creamy avocado for a light summer salad. 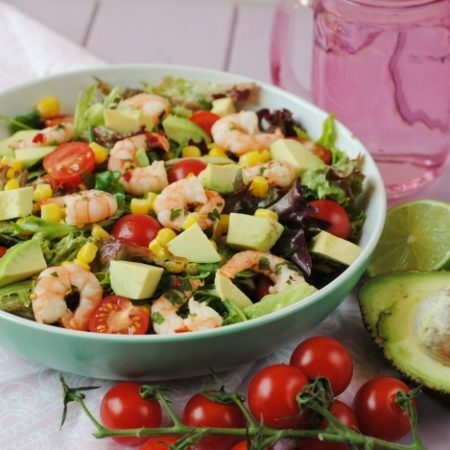 This Chilli and Lime Prawn and Avocado Salad is a great way to make use of homegrown tomatoes too. We only have a few more weeks of summer left, so we need to make the most of that and pack in some delicious summer salad recipes and I think that this salad screams summer. Plus, it’s easy to make a big batch of it if you are having friends over for dinner. 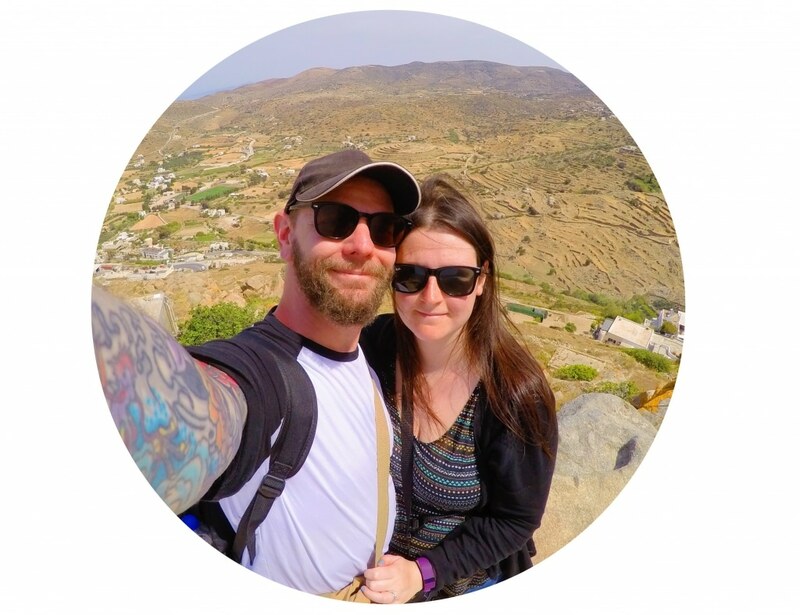 Thanks for all the lovely comments on our baby gender announcement on Friday – we are super excited, but of course we would have been either way. But, we have some more exciting news (not on the same level of course). We have some ripe tomatoes in our garden that we have picked and they are amazing! If you follow me on Instagram and you check out Instagram Stories, then you will have seen this yesterday (if you don’t follow me on IG already, click here to follow me). You just really can’t beat fresh tomatoes picked straight from your garden. You might remember that at the beginning of the summer we started working with Wyevale Garden Centres to talk about the Benefits of Gardening, and then we showed you a Space Saving DIY Herb Garden and then we post DIY Strawberry Guttering tutorial. Well, the strawberry guttering fit in to a planter that we were growing tomatoes in and as well as already having had lots of strawberries growing, we are now starting to enjoy the tomatoes. Wyevale Garden Centres have a fantastic selection of plants to get you started in your garden, as well as all the essentials that you need to go along with it, like really good quality soil. We have tried to grow tomatoes in the past, with not much luck, and the one main difference that we made this year is using good quality soil from Wyevale Garden Centres and also feeding the tomatoes every week. It’s really worth getting good quality products when it comes to gardening, as the return will be much better. Although some of our other plants fell victim to the slugs (thanks crazy UK weather), the tomatoes really thrived. One of the best things about Wyevale Garden Centres (in my opinion) is that they have a fantastic website, so you can browse from the comfort of your own home. It’s never too early to start planning your garden for next year! We are even growing some cucumbers too and they are coming along nicely. They still have a long way to go and I don’t think they are going to get very big, but we will be pickling them at the end of summer as pickled cucumber are the weakness of every pregnant lady, right? The heatwave didn’t really happen up north last week, but we are set for 3 days of sunshine, so I am trying to only work for a couple of hours in the morning and get out and enjoy the sunshine. I have been wearing my FitBit religiously and trying to smash my 10,000 steps a day target and aiming for 15,000 a day. It’s amazing how many steps you rack up walking around the house and organising a nursery. All the furniture is now built and we are putting the finishing touches on it – I can’t wait to share some photos with you all! Keeping busy and staying active means that I need to refuel my body correctly and as I feel like I am constantly hungry, I am trying to up my protein and healthy fats in my meals. So, prawns and avocado just seemed like the perfect combination for a salad, which some home grown tomatoes of course. Make double and take some to work the next day – it beats a boring store bought sandwich! In a bowl, mix together the prawns, lime juice, chilli, garlic and olive oil. Add to a hot pan and cook gently for 2 minutes. Divide the rest of the ingredients between 2 bowls and top with prawns. I have never got on with avocados but I keep seeing people using them. I need to try some more recipes.